Easy port access means Maryland apple farmer JD Rinehart can market his product to a specialty market in Central America. Garrett County farmers Brent & Gary Fratz face unique farming challenges due to their high altitude and distinct soil type. Urban farmer Denzel Mitchell expands to the country to meet high demands for his specialty produce. Learn about this unique farm's philosophy with Mitchell, farm manager Blain Snipstal and intern Aleya Fraser. Local Buy: Al Spoler investigates which are the choicest cuts when it comes to pork. Before crock pots came along, apple butter was traditionally cooked in a kettle over an open flame. To keep the apples from sticking and scorching, the butter had to be stirred constantly – for a full eight to twelve hours! Specially designed stirrers like this one had long handles so weilders could keep their distance from the fire, and holes drilled into the paddle to really work the apples into a pulp. 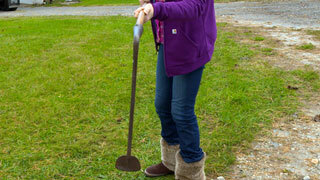 There are a number of theories regarding the proper stirring technique – figure eight, back and forth, round and round. But one popular method involved tossing a silver dollar or two into the kettle. As the butter was stirred, the silver dollars scraped around the bottom, loosening up any apples that started to stick. Mix herbs, seasonings and oil in a bowl. Trim and slice pork tenderloins. Rub herb mixture on pork tenderloins and allow to sit 2 hours. Combine ingredients in a blender, and mix until emulsified. Preheat the oven to 350°F. Season the pork chops with the 1/4 teaspoon of the salt and 1/4 teaspoon of the pepper. Heat the shortening in a large cast iron skillet until hot but not smoking. Reduce the heat to medium-low and sear the pork chops for about 2 minutes on each side. Remove the pork chops from the pan and transfer them to a large plate. Reduce the heat to low and add the butter, onion, celery and apple. Cook about 3 minutes, until the apple is slightly soft. Add the bread cubes, the remaining 3/4 teaspoon salt and 1/4 teaspoon pepper, the sage, rosemary and thyme, and stir. Add the broth and the cranberries and toss the bread cubes to moisten them. Remove the stuffing from the heat. Stuff each pork chop with a slice of the goat cheese and as much stuffing as will fit in the pocket, about 2 tablespoons. Secure the stuffing with a toothpick poked through either end of the pocket. Transfer the pork chops to a 9-by-13-inch baking dish. Transfer the remaining stuffing to a small, buttered baking dish. Cover the stuffing and slide both dishes into the oven. Bake the stuffing and pork chops for 45 minutes, until the stuffing is golden and the pork chops are cooked through. Remove both dishes from the oven, uncover the stuffing, and serve it immediately with the pork chops. Want to give these recipes a try? 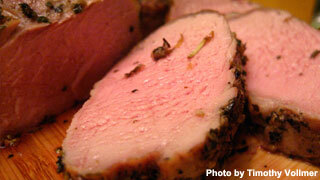 Pick up some delicious woodland pork at Cabin Creek Heritage Farm in Upper Marlboro. They also sell grass-fed beef and lamb, pastured chickens, turkey, non-GMO eggs...even home-spun yarn!